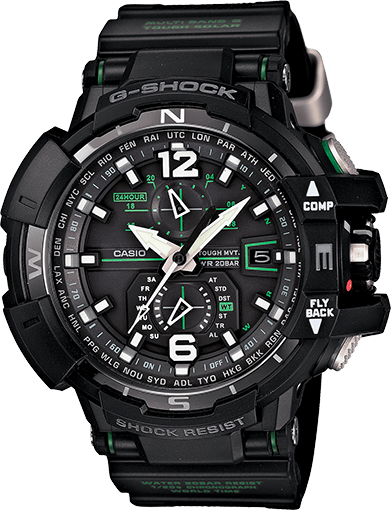 The G-Shock Gravitymaster Aviation Series is one of the most exciting and popular G-Shock specialty lines. Like the Master of G series it features the latest technology and is intended for professional use. The various aviation models all look very similar and it can be difficult to remember what the differences are so here is a concise guide to all the 2019 G-Shock aviation watches and their distinguishing features. The aviation models are also known as the Gravitymaster series or the Sky Cockpit series in Japan. 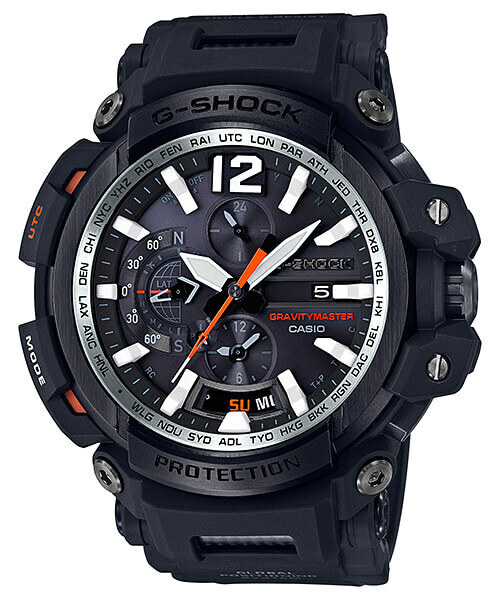 Update: Also see the recent GR-B100 Gravitymaster Series. This is a Tough Solar model with Bluetooth mobile link, STN LCD display, and Super Illuminator LED light. All the aviation Gravitymaster models are large-size watches with analog displays and feature shock resistance and 200 meter water resistance. All the Tough Solar/Multi-Band 6 models feature full analog multi-dial displays with Neo-Brite luminous hands, and Triple G Resistance to shock from dropping force, centrifugal gravity (g-force), and heavy vibration. Note that models with the Neo-Brite luminous hands do not have a viewing light with the exception of the GPW-1000, though the luminous hands will glow in the dark. Notes: When using the compass on the GA series the seconds hand will point north while the direction name and direction angle value will be shown on the two digital displays. Notes: The GA-1100 is notable for having a second analog time display, allowing you to view two time zones simultaneously. 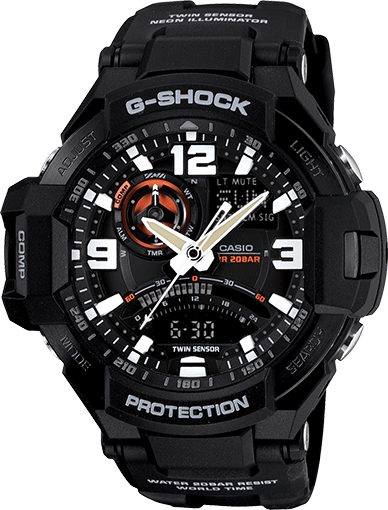 Notes: The G-Shock GR-B100 is the second (after the GPW-2000) and most affordable Gravitymaster watch with the Bluetooth mobile link function. 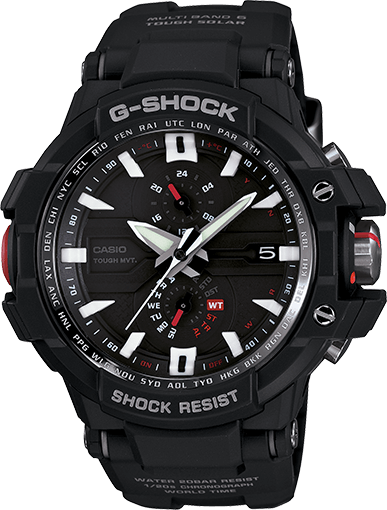 The Bluetooth connection provides a flight log point recording function, automatic time adjustment, easy watch setting, and phone finder function through the G-Shock Connected smartphone app. Notes: The GW-A1000 has the Smart Access electronic crown which allows intuitive access to the watch’s functions. Sub-dials show the day, date, and 24 hour time. The GW-A1000’s face has a subdued look with its numberless display and seems more stylized than the other aviation models. 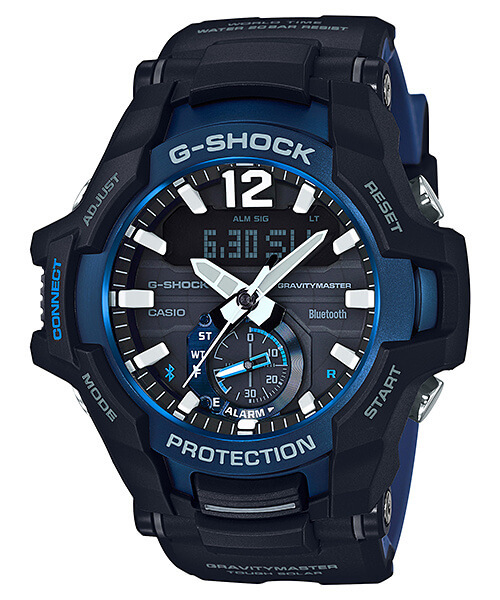 Notes: The GW-A1100 has a sapphire crystal which is only available on a few high-end G-Shock models. We like the looks of the GW-A1000 but prefer the compass sensor of the GW-A1100 over the thermometer. The “Fly-Back” button seen in the photo allows the chronograph to be instantly reset and restarted. The GW-A1100 would be a good all-around choice for any pilot. 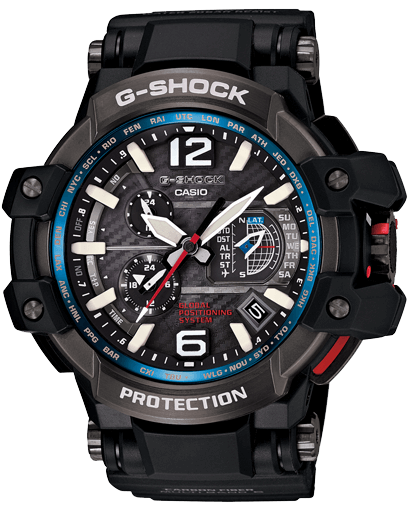 Notes: The GPW-1000 was the first G-Shock watch with GPS Hybrid Wave Ceptor technology. This allows the watch to synchronize the time with GPS satellite signals if outside the range of Multi-Band 6 radio signals. It also allows the watch to adjust the time zone and DST automatically. As one of only two G-Shock models with this feature it is one of the most innovative aviation watches available. The GPW-1000 is a good choice for a pilot who is constantly crossing time zones. Its features also make it useful beyond aviation and into the realm of extreme travel and adventuring. It is also available in a lighter titanium version. Notes: The GPW-2000 has the same features as the GPW-1000 plus more and comes in at a lower price point. New features include Bluetooth connectivity to a smartphone, which gives the phone another method to automatically sync the time. The Bluetooth link can also be used to adjust the watch settings and alarm, and for GPS tracking with the flight log function on the G-Shock Connected app. The watch also displays latitude and longitude position information from GPS signals on its display. 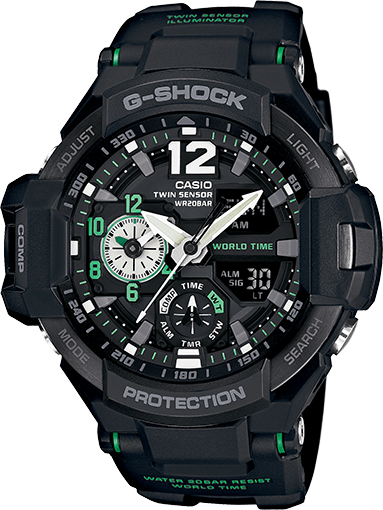 The GPW-2000 has the same high-end components as the GPW-1000 such as an anti-reflective sapphire crystal and a carbon fiber insert band. It also has a screw-free band design to prevent the band coming loose when exposed to heavy vibration. will there be UV-LED multiband 6 available? I just want visibility at night and atomic features i.e, auto dst. Hmm, not sure about future aviation releases with LED light and Multi-Band 6… right now the GPW-1000 is the only aviation model with that. Maybe you should look into the Gulfmaster, Mudmaster, or the import G-STEEL models with Multi-Band 6. This guide was really informative! Is there a guide like this for the Gulfmaster series? I checked the site a bit, could not find one. As someone who is considering buying a Gulfmaster but is not sure which one, I would really appreciate a guide like this. Especially since we have a Quad-Sensor, haha. Not yet but maybe I will write one in the future. For now you can read our articles about the different Gulfmaster models: GWN-Q1000 (Tough Solar/Multi-Band 6, Quad Sensor), GWN-1000 (Tough Solar/Multi-Band 6, Triple Sensor), and GN-1000 (Twin Sensor). For price and features I recommend the GWN-1000. How long does the battery last on a gravity master watch? Depends on the model and if is solar or not. Estimated battery life for a non-solar Gravitymaster is 2 years. Solar rechargeable battery should last much longer.